Thanks to a generous gift and UC Merced Graduate Division, we have been able to support these fellows as they have pursued research in the Center. Palefsky’s project, “Bioarchaeology of Social Inequality during the Bronze (1500 - 1000 BC) and Iron Age (500 BC - AD 500) of Central Thailand” investigates the development and embodied consequences of social inequality through the analysis of human skeletal remains, mortuary contexts, and the dietary and migration histories that become chemically incorporated into the matrix of human bones and teeth. Her research aims to contextualize the social role of rice and the social implications of migration in prehistoric Central Thailand, specifically at the archaeological sites Tha Kae, Phu Noi, Ban Pong Manao, Huai Yai, and Ban Maichaimongkhon. 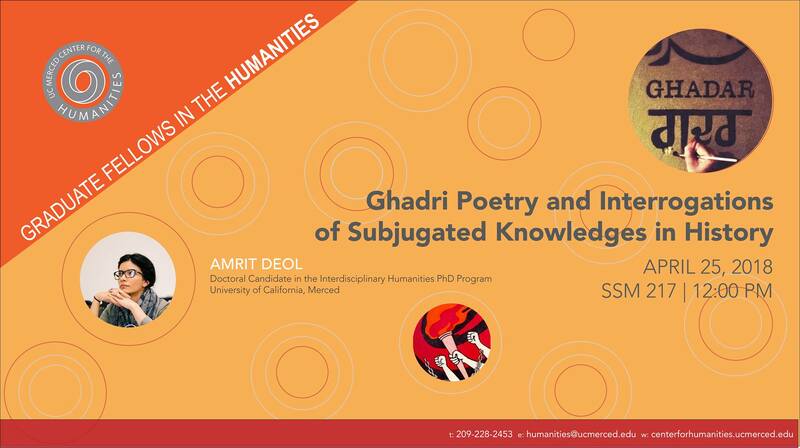 Deol's project “Ghadri and Sikh Cosmopolitanism: Interrogations of Subjugated Knowledges in History,” locates the multifaceted experiences of early Sikh immigrants from Punjab to North America from 1913-30. Speciﬁcally, she examines the development of anti-colonial thought and activity among Sikh farmworkers after their arrival to North America. Home to many early South Asian immigrants, California’s Central Valley served as a key location for global resistance to empire in the form of the Ghadar Party. De Wolff received her Ph.D. in Communication and Science Studies from the University of California, San Diego. Her research interests include the Great Pacific Garbage Patch and oceanic environmental problems with cultures of consumption and waste. During her fellowship, De Wolff will extend her research to elaborate how undercurrents of capitalism form a garbage patch and how the debris from the March 2011 Japan Tsunami redefines problems of plastic pollution in the North Pacific. Her public humanities project “Watershed Connections: the Art and Science of Ecological Flows” will consist of a series of collaborative events that connect water-themed art and science with the community in the context of immediate local challenges. Faletti received her Ph.D. in Art History from the University of Texas at Austin. Her research interests include art, architectural history, and California history. During her fellowship, Faletti will expand her research to include studies in Southern California and garden, landscape and urban development architecture as it pertains to waterworks sites in California. She plans to curate an art exhibit “Art and Watershed Relevance: California Water in Image, Art and Public Consciousness” as her public humanities project with the Center. Dawson’s scholarship examines how slaves carried African maritime skills, including swimming, surfing, underwater diving, and canoeing, to the Americas. There, they recreated and reimagined African traditions to provide their exploited lives with meaning and purpose even as slaveholders exploited these skills to make slavery more profitable. His project considers how West Africans and Hawaiians similarly treated water as a social, cultural, and political space. Mostern's research focuses on spatial history. She studies the relationship between territory and state power in imperial China as well as methods to model, visualize, integrate and analyze historical spatial information. Her current project, tentatively entitled “Following the Tracks of Yu,” is a long-term history of human-environment interaction on the Yellow River. It incorporates historical spatial data, a historical event database and a historical gazetteer as well as archival documents and findings from environmental science. Moyes will conduct an ethnography project looking at how local farmers have responded to environmental pressures of drought. Moyes expects that research from the present Central Valley and historic comparative research will shed light on processes of collapse and abandonment by looking at how farmers’ response to drought morph from optimism to pessimism, from staying in place to migration. Barton’s project reconceptualizes the refugee-subject and how her mobility subverts and destabilizes the legal, geographical demarcations of the modern nation-state, its bio-power, and security apparatus. She explores the movement of Syrian women across the Mediterranean waters in relation to media narratives that simultaneously re-inscribe violence and visibility onto the invisible refugee body, only to deny her asylum. As the primary [water]“squatters” (Kapur 2003), Syrian refugee-subjects also resist western notions of family, community, nation, and culture, defying the nation-state’s notion of border protection and need for territorialization and securitization of the oceans (Perera 2013). In this project, she seeks to explore how refugees ‘free’ water from empire’s logic of territorialization. Caskey delves into what happens when a natural riparian landscape is forever altered in the name of progress. With his project, he intends to use archival material, oral history, digital humanities and/or curation with local environmental stewardship groups to document the impact of the 1978 New Melones Dam, one of the last major damn projects in the American West. Caskey plans for the project to become part of his dissertation on how historic water development of the Stanislaus River has attempted to tame, control, and commodify its waters. Extending research on the transformative link between landscapes and their users, and Chandra’s interest in popular visualities and space, this project will analyze the ways in which cinematic waterscapes frame national, gendered, and racial identities. It will focus on two themes: first – a comparison of films based on the 1947 Indo-Pak partition, when water bodies became a place of death during the violence ensuing the division, with the converse use of water by post-independence nationalistic cinema as a source of life, progress, and industrialization. Second, a comparison of films set in the colonial era, which will examine the presence of water with its absence and manner in which excess or lack thereof is used to shape the Indian landscape. Kaur Hundle links “Water” to a reconceptualization of territorial land and border-based concepts of citizenship in contemporary Uganda. More specifically, she explores the mobilization of the Great Lakes, the Nile, and the Indian Ocean in historical narratives among South Asian and Baganda (one of the ancient Great Lakes Kingdoms) interlocutors in claims surrounding racial, ethnic and religious multiplicity, and inclusion and difference in contemporary Uganda. She will explore the question: what does the Indian Ocean frame, and what do other water bodies in the region mean for the study of African-Indian relations in Uganda??. Wilkinson’s research focuses on the modern use of caves as sacred spaces in Haitian Vodou, with a primary focus on the coastal caves around the port city of Cap Haitien in northern Haiti. Much like Vodou, water is a thread that connects all Haitians. Haitians pray to water spirits for health, for success, for luck, and for vengeance, and the caves in which water spirits live are pre-eminent locations to seek their favor. Wilkinson’s public humanities project is a planned exhibit that will include photographs, video, artwork, and handicrafts collected in Haiti that connects to water through several themes: coastal communities, cave rituals, festivals, deforestation and tourism. Jolaosho received a Ph.D. in Cultural Anthropology from Rutgers University. Her project involves analysis of more than 80 hours of video footage and song recordings collected in South Africa. She works on disruptive performances that generate new modes of collective solidarity and social identity. Her research will produce an interactive virtual exhibition for the public. To learn more about her work, see her recent article in Smithsonian Folkways Magazine. Jelly-Schapiro received his Ph.D. in American Studies from Yale University. His book manuscript seeks to embed the cultural and political forms of the War on Terror within the long history of modernity, through readings of contemporary fiction and theory. Engaging the theme of “the world upside-down,” his project will consider conceptual paradigms such as “security,” “terror,” and “emergency” from the perspective of the global South, with an attention to how modernity is constituted by the so-called periphery of the world system. His public humanities project involves curating an art exhibit and workshops with veteran artists at the Merced Multicultural Arts Center: "Emergency/Emergence: Art After War." López-Calvo's fellowship year will be spent working on the project, "Brazilian Nikkei Diasporic Identities and Cultural Production." He is the author of seven books on Latin American and U.S. Latino literature and culture. He is also the co-executive director of the academic journal Transmodernity: Journal of Peripheral Cultural Production of the Luso-Hispanic World. Quinn will be working on the project, "Persianite Historiography in the Early Modren Empires," during her fellowship year. Her main area of research focuses on the history of Iran during the Safavid era (ca. 16th-early 18th centuries), with a special emphasis on historiography. She is currently working on a comparative study of Persianate historical writing under the Ottomans, Safavids, and Mughals. During his fellowship, Martín-Rodríguez will be working on the project, "Real Life in Jest: The (Borderlands) Upside-Down World of José Díaz." Some of his publications include Cantas a Marte y das batalla a Apolo: Cinco estudios sobre Gaspar de Villagrá (Academia Norteamericana de la Lengua Española, 2014), a scholarly edition of Gaspar de Villagrá’s Historia de la Nueva Mexico (Universidad de Alcalá de Henares, 2010), Gaspar de Villagrá: Legista, soldado y poeta (Universidad de León, 2009), and La voz urgente: Antología de literatura chicana en español (Editorial Fundamentos, 1995, 1999, and 2006). 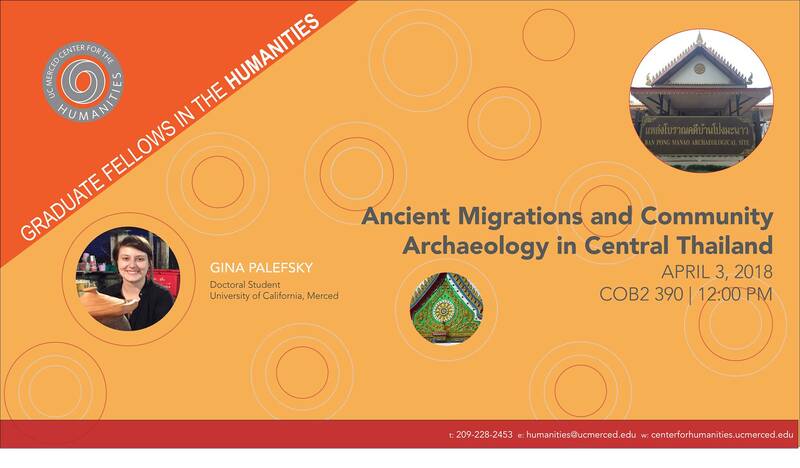 Arksey will be working on her doctoral dissertation on why the “Collapse” of 7-9th centuries drove the ancient Maya to formalize the areas outside of caves for the first time as part of long-standing ritual activities already taking place inside caves. She seeks to address why these spaces took a more naturalized form than the formalized, grand temple plazas of this time period. This research has forced a rethinking of what is considered ‘underground’ and forms the basis for an exhibit which look at the various ways in which humans have, and continue, to use the ‘underground’ throughout the Americas. Her public humanities project is the exhibit, "The Americas Underground: Where Our Past and Present Meet in the Dark" at UC Merced's Kolligian Library. 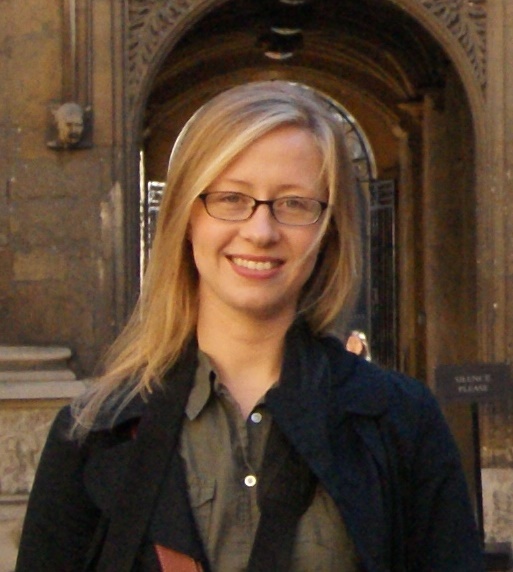 Riegel’s research focuses on the literature and social history of Early Modern England; she is interested in the ways that trickster characters such as Robin Goodfellow illuminate and address social issues. Her project investigates the trickster’s bag of tricks including magic, gender embodiment and transformation, and humor as tools for social change. Riegel also hopes to identify additional literary tricksters. Drawing on the results of this trickster research, her project will include the development of a high school curriculum packet for Shakespeare’s A Midsummer Night’s Dream, based on Common Core standards..
DeLugan compares how and why, after decades of relative silence, infamous episodes of 1930s state violence are being publicly remembered today in El Salvador, Dominican Republic and in Spain. Through ethnographic research she will examine how the 1932 “Matanza” (“Slaughter”) of Indigenous people in Western El Salvador; the 1937 “Parsley Massacre” (“El Corte”/”Kouto-a”) of black Haitians in the Dominican Republic; and the excessive state violence of the Spanish Civil War (1936-39) are being publicly recalled today. Vanderschraaf explores the following questions: 1) What are the conditions that characterize social conventions? 2) How do conventions originate? 3) Can one understand moral norms, and in particular norms of justice, in conventionalist terms? 4) How and why do conventions sometimes change? By answering these questions, he will offer a conventionalist analysis of natural moral law. His short-term goal is to publish several essays on convention and natural law. His long-term goal is to publish a book on the topic. Brokaw will work on her book manuscript, “Staging Harmony: Music and Religious Change in Early English Drama, 1450-1611,” which argues that the theater’s representations of this often contentious music offer a place of compromise for audiences of mixed religious identities. The six-chapter book moves from religious drama of fifteenth century East Anglia to Shakespeare’s late plays. Di Franco conducts dissertation research on how knowledge of artifacts is produced and acquired through different media, including visual examination, physical interaction, three-dimensional virtual and material replica interaction. She is particularly interested in how 3D virtual reproductions of artifacts affect people’s perception of the past and influence the ways people see ancient artifacts. Her work will culminate in a public exhibit, "What Are You Looking At? Experiencing the Archaeological Record."Library. Lanfranco’s project analyzes the 1989 Chinese Pro-Democracy Movement as experience, event, myth, materials and social memory. He will plan a commemorative exhibit, "89@25" at UC Merced’s Kolligian Library.